Following the relocation of the artefacts, a team from Yale University, the University of Bologna and the Provinciale Hogeschool Limburg, Belgium, has completed the first epigraphic and digital record of a site near Nag El-Hamdulab on the west bank of the Nile, north of Aswan. 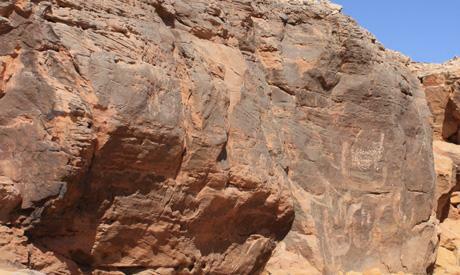 The site was discovered nearly half a century ago by the famous Egyptian Egyptologist Labib Habachi. Minister of State for Antiquities Zahi Hawass said this new and thorough study has brought to light a previously unknown Early Dynastic cycle of royal images and an early hieroglyphic inscription. This work was carried out by the Aswan-Kom Ombo Archaeological Project (AKAP), which is a joint venture between Yale and University of Bologna, lead by Maria Carmela Gatto and Antonio Curci, with an international research team from various European and America countries as well as Egypt. Now in its seventh season, the project aims to survey and rescue the archaeology of the region between Aswan and Kom Ombo, in the southern part of Upper Egypt. Gatto said that this group of images and the short inscription—carved around 3200 BCE, at the dawn of the dynastic period—record the earliest depiction of a royal Jubilee complete of all the elements known from later documents: an Egyptian ruler wearing a recognizable crown of Egypt; “the following of Horus”; and the royal court as known it is known to have been in Early Dynastic accounts such as the Palermo Stone. She explained that the Nag El-Hamdulab scenes are unique, bridging the world of the ritual Predynastic Jubilee in which images of power—predominately boats and animals—are the chief elements, and the world of the royal pharaonic Jubilee, in which the image of the human ruler dominates events. The Nag El-Hamdulab cycle of images shows the emergence of the ruler as the supreme human priest the manifestation of both human power and the divine incarnate. The Nag El-Hamdulab cycle is the last of the old nautical Jubilee cycles of the Predyanstic Period, and the first of the pharaonic cycles over which the king presides in full regalia, here the oldest form of the White Crown. The Nag El-Hamdulab cycle is also the first such image with a hieroglyphic annotation. That text refers to a vessel of the “Following,” probably the “Following of Horus,” and may therefore be the earliest record of tax collection we have from Egypt, and the first expression of royal economic control over Egypt and most probably also Nubia. 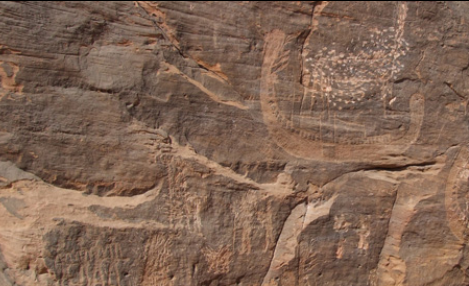 Mohamed El-Beyali, the general director of Aswan and Nubia monuments, said that the Nag El-Hamdulab cycle of images probably dates back to about 3200 BCE, corresponding to the late Naqada period. In other words, it is from the time between King Scorpion (the owner of tomb Uj at Abydos), first king of Dynasty 0, and Narmer, first ruler of Dynasty 1.